A ducted air conditioner can keep your whole home cool so it won’t matter where in the house you spend your time. The Heat Shop specialises in Daikin ducted air conditioning from our Geelong and Yarraville stores but also offers other top brands on the market. 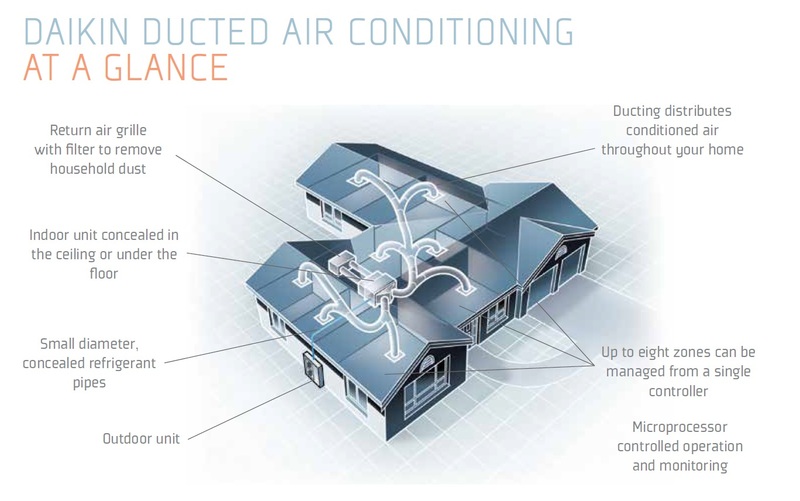 A discreet ducted air conditioning system is the ideal choice when you want optimal comfort. With a ducted air con, the indoor unitis concealed in the ceiling or floor, sending conditioned air to chosen rooms of the house via a hidden duct network. A compressor is installed outside the home. As with all reverse cycle systems, a ducted air conditioner can heat your home just as well as it cools it. With the press of a button your ducted reverse cycle air conditioning system will send warm air throughout your home, making the system the ultimate heating and cooling option for every room in the house. But it’s not just homes we service. We’re also a leading provider to business and our Yarraville and Geelong teams offer ducted air conditioning for commercial needs. Contact us at the Heat Shop in Melbourne, where we provide ducted air conditioners across the city, while our Geelong store services the greater Geelong region. You can see our great range in store or online, including split systems air conditioners, multi-split systems and loads of heating options.